Doosan Portable Power is proud to introduce the company’s first natural gas mobile generators. The new NG160, NG225 and NG295 natural gas-powered generators combine the ability to operate on wellhead natural gas with rugged, reliable features that ensure performance in remote locations and harsh environments. 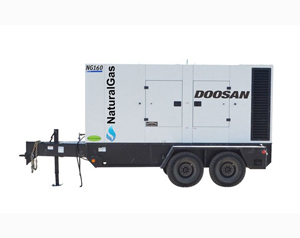 The natural gas generators from Doosan Portable Power are ideal for use in oil and gas exploration, site preparation and production, water well drilling, industrial plants and as auxiliary or maintenance power in factory settings. Doosan Portable Power has designed a line of natural gas generators to help increase uptime in critical operations, decrease time devoted to service and maintenance, and to avoid the costs associated with diesel fuel. The all new NG160 from Doosan Portable Power has been engineered to meet the demanding needs of the oil and gas market. Rugged, portable, durable; the NG160 is sure to deliver the clean, dependable power you demand. Natural gas generators from Doosan Portable Power are designed to help you avoid diesel fuel costs and increase uptime in critical operations. The new NG160, NG225 and NG295 meet the rugged portable power requirements of the oil and gas market and have the ability to operate on wellhead natural gas.